Want to reach independent booksellers? ABA offers a variety of ways to do so, whether you’re a publisher, author, or industry vendor. If you’re an ABA member bookseller, we have options for you, too: free Classified Ads are a benefit of membership. The official ABA website is a great way to reach member and non-member visitors and reinforce your marketing message. 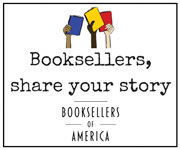 On BookWeb.org, ABA members and other industry professionals learn about upcoming association events and industry news, discover ways to maximize their ABA membership, view the latest news from Bookselling This Week, and much more. Advertising on www.BookWeb.org offers several cost-effective opportunities to position your company as a leader in front of an influential group of retail bookselling professionals. Please see this brochure for information about advertising on BookWeb.org, and contact Multiview's sales team to book. Now more than ever, professionals consume information on the go. Headlines and links for Bookselling This Week, a dedicated section of BookWeb.org, are sent out via e-mail each Wednesday as a weekly e-newsletter, reaching the inbox of more than 13,000 industry professionals. Bookselling This Week allows members to stay informed about timely industry topics and association news whether they are in the store or on the road. Please see this brochure for information about advertising in BTW, and contact David Reeder at MultiView to book. The ABA bookstore mailing list is available for rental by ABA Regular and Associate members only. It is delivered electronically, in an Excel file format. Listings consist of the bookstore name, main contact, and full address; it does not include e-mail addresses. Associate members in good standing are entitled to two free mailing lists a year. To claim these, please write to Director of Development & Publisher Relations, Matt Zoni at matthew@bookweb.org. To order mailing lists in addition to the two complimentary lists, please complete the form found here. Please email info@bookweb.org with any questions. BTW is the voice for independent booksellers nationwide. From ABA initiatives to bookstore openings, and from updates on ABA member services to ABFE's advocacy-related activities, BTW is a trusted, free resource for independents. Read the latest news. In addition to booksellers, BTW is read by publishers, agents, writers, distributors, wholesalers, and the media. Circulation is over 13,000, and headlines are published via a weekly e-mail every Wednesday. Classifieds appear on a dedicated page on the BTW website. Here's a sample. All Regular ABA Member Bookstores in good standing may have up to four free 150-word, two-week Classified Ad insertions per calendar year. Additional ads may be purchased at a 25 percent discount off the regular rate. Classified (non-commissionable): $100 per ad, with a 100-word maximum. Note: All classified ads require prepayment. To place a classified ad please contact Liz Button via e-mail or phone at 914-406-7520.